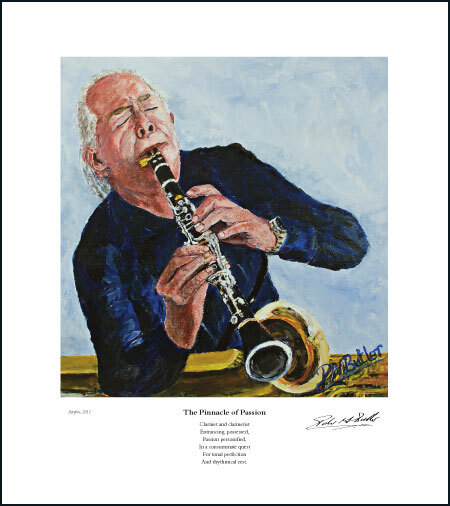 When Laurie Fray commissioned his jazz portrait playing the clarinet, I needed look no further for reference material than my jazz photograph of his stunningly moving rendition of George Lewis’s “Burgundy Street Blues”. Beautifully played on his Selmer St Louis Bb Clarinet, it lifted and added class to a lively jam session at the 2011 Autumn Parade in Hemsby, Norfolk, where I was privileged to watch him patiently mentoring a young clarinetist acolyte. 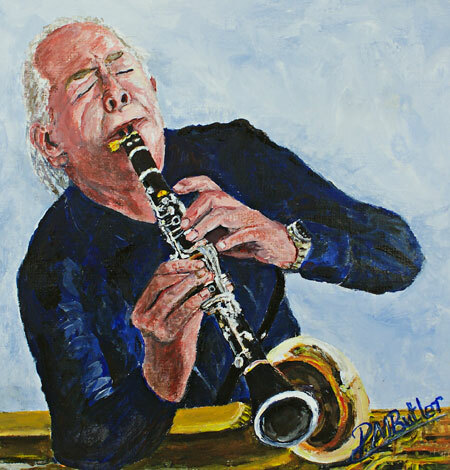 Entranced by Laurie’s passionate performance, his jazz painting commission was a joy to fulfil. At the time, Laurie played reeds with Anything Goes Thames Valley Jazz Band. Peter – Thank you for a fantastic portrait. Perhaps I am am getting a little fussy about how I appear – it’s called getting old! (Thanks for diguising that!) But It really is a great piece of work and, to me, it’s a memory to pass on to my grandchildren. See you at the next Jazz Festival, where ever that may be. Keep up the good work to promote our love – Traditional Jazz! Thanks so much, Laurie, for such high praise. Obviously I would like more commissions like yours and to sell more of my jazz prints, especially to help me do as you say and “keep up the good work to promote traditional jazz!” As for you getting old, come off it, I didn’t need to disguise anything!